Today we will share a simple Spring 3 inversion of control hello world example program. What is Inversion of Control (IOC) or Dependency Injection (DI)? Inversion of control or dependency injection is an object oriented programming technique, in which the object coupling is done at runtime instead of compile time. The responsibility of creating, injecting and managing the life cycle of the object is inverted from programmer to framework. For more details on inversion control and related patterns please refer to this post from Martin Fowler. In the above listed containers Spring is the most commonly used DI framework. Google Guice is still in beta version. Spring 3 IOC Hello World example program. In this example we are using spring 3.2.3.RELEASE. 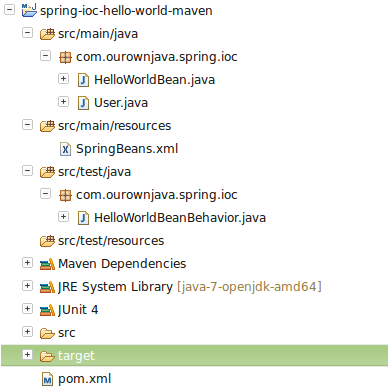 Maven repository for Spring 3. Spring 3 IOC example complete code. * Spring 3 IOC Example Program. Please click here download the complete source code. Spring MVC REST – Unit Testing Post Request. Unit Testing Spring MVC REST Controllers. Spring Data MongoDB – Unit Testing using in memory Fongo. « How to create a data source/connection pool in JBoss?